Past the midway point of the 2014 Major League Baseball season, some clear candidates have emerged for the most valuable player (MVP) award in each league. While some perennial candidates have returned for consideration, new personalities and rejuvenated sluggers have made the race more exciting this year. Here are six players (three from the National League and three from the American League) who are worthy of MVP honors as the season begins to reach crunch time. When John Lackey of the Red Sox whined about the way Nelson Cruz throttled him in a recent game, it struck most of the baseball world as sour grapes. After all, Cruz is far from the only MLB player who has been suspended for using performance-enhancing drugs (PEDs). In fact, the Red Sox recently had a PED user with two failed drug tests (Manny Ramirez) throw out the first pitch at a celebration of the 2004 World Series team at Fenway Park. Buck Showalter also reminded Lackey that he might want to check the record of players on the current Red Sox team before speaking further on the topic. Cruz did what any elite player should do. He shrugged it off and went back to mashing the baseball after his historic 5-for-5 performance against Lackey and the Red Sox at Fenway. Cruz is leading Major League Baseball in home runs (28, tied with Jose Abreu), RBI (74), and total bases (202) through 90 games. 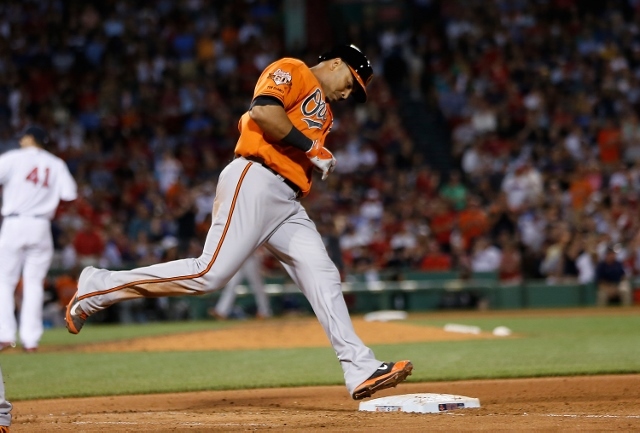 For a team that has been hit by injuries and poor production from Chris Davis, Cruz has risen to the challenge and silenced critics by carrying the Orioles on his back into first place. That’s MVP work. 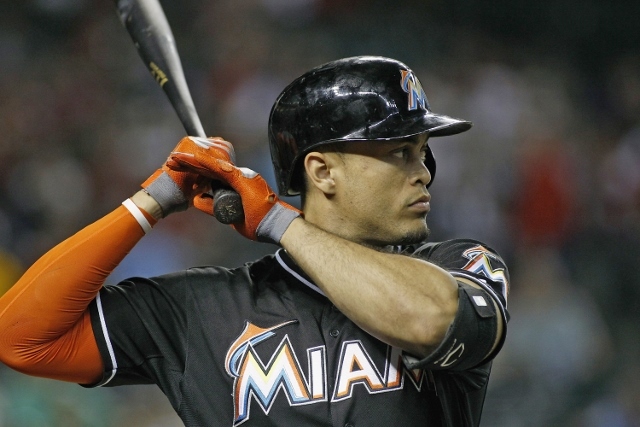 Big Giancarlo Stanton has been the epitome of a valuable ballplayer in 2014. Playing for a team struggling to get above .500 after 91 games, it is fair to ask where the Marlins would be without Stanton in the lineup after the loss of ace Jose Fernandez. In all likelihood, they would be in last place in the NL East rather than 5.5 games out of first. Either way, Stanton will have a chance to show fans what they got wrong in the 2014 Home Run Derby. When he’s healthy, it is safe to just pencil in Mike Trout when drawing up any list of MVP candidates. Trout has not shown any signs of slowing down in his third full MLB season. In fact, Anaheim’s five-tool superstar is on pace to shatter previous career highs in home runs, RBI, runs scored, slugging, and hits. He’s even gotten more efficient on the base paths. 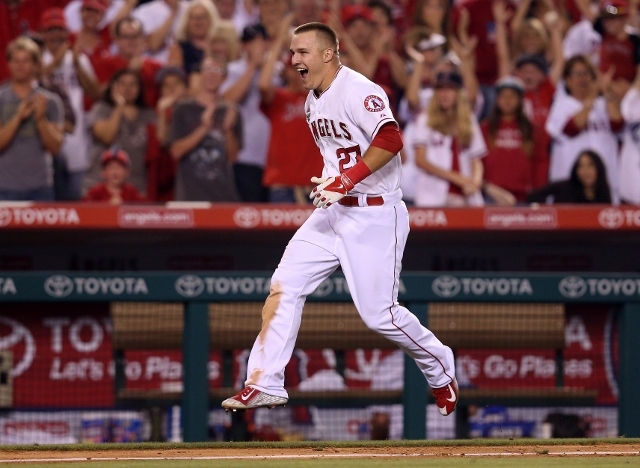 Trout is a perfect 10-for-10 in steals in 2014. But enough of comparing Trout against his own lofty standards. Trout’s 1.003 OPS leads the American League while he is second in slugging (.602), second in OBP (.401), third in runs scored (63), fourth in home runs (21), fourth in walks (52), fifth in RBI (68), sixth in doubles (24), eighth in batting average (.310), and 10th in hits (103). Of course, it comes as no surprise to find him leading the MLB with his 5.3 WAR at the midway point. Just hand him the MVP award and get on with the rest of the season. The National League yin to Mike Trout’s yang, Troy Tulowitzki covers the ground at the most important infield position while attacking the baseball unlike any of his peers. Despite the glorification of the designated hitter role, elite ballplayers have to excel at — or at least play — both sides of the game for MVP consideration. 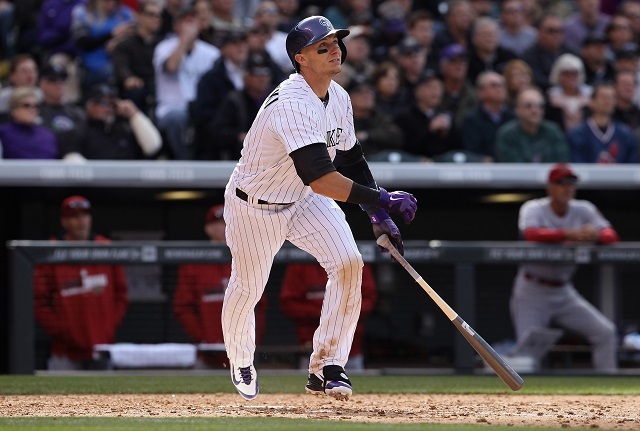 Playing for an owner who’s known for not quite winning over fans for his last-place team, Tulowitzki’s 5.2 WAR is best in the National League, and it doesn’t take more than a glance to see why. Tulo’s .350 batting average, 1.057 OPS, and 70 runs scored are all bests in MLB in 2014, while his .441 OBP (half the OPS stat) is more than 25 points better than the nearest competitor. Does he play half his games in Coors Field? Sure he does, but the Phillies play half their games in Citizens Bank Park, as do the Cubs at Wrigley Field. In other words, he’s not the only one playing in a hitter-friendly ballpark. Tulowizki’s .433 home batting average shows his performance far surpasses the effects of Rocky Mountain air. 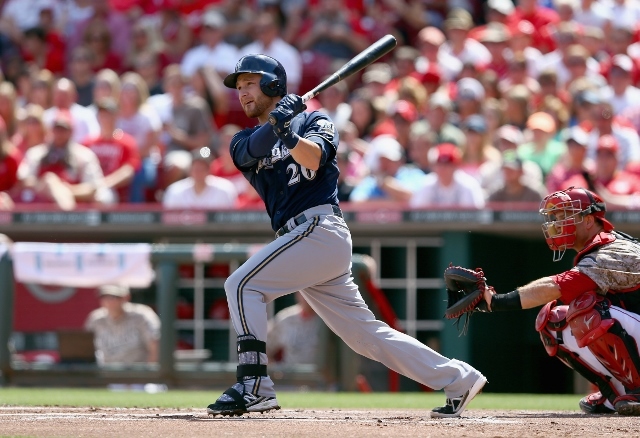 For voters who prefer candidates on winning teams, Jonathan Lucroy is an obvious choice in the National League. Like Tulowitzki, he provides sensational defense at one of the game’s elemental positions. Lucroy has provided the same impact defensively for the Brewers as Buster Posey has in previous years for the Giants in coaxing pitchers through games and expertly handling umpires at the same time. Offensively, Lucroy is near the top in most categories, slotting in at second in doubles (31), third in batting average (.323), and sixth in OPS (.897) among NL players. Producing at that level while catching nearly every game for the a first-place team is worthy of recognition. Many would argue it is worthy of National League MVP honors. 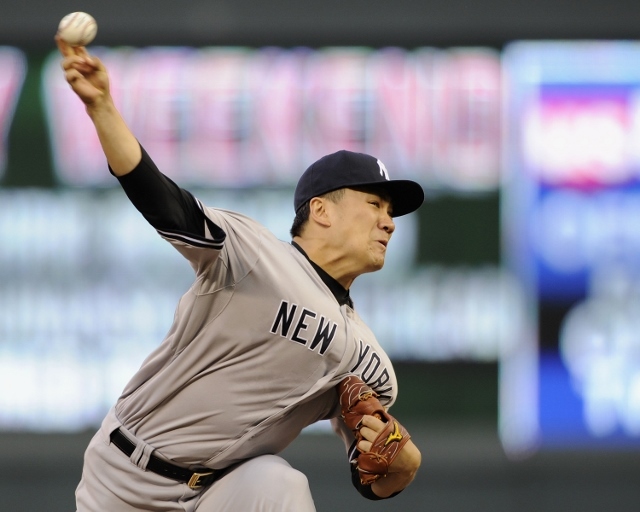 Tanaka, who was diagnosed with a torn UCL on July 10, has been the one indispensable player on the Yankees in 2014. Despite missing three of their Opening Day starters, the Yankees somehow remain in the race at the All-Star Break, less than five games out of first place in the AL East despite an ugly run differential of minus 37. How have the Yankees been outscored by 37 runs yet still have a winning record? The answer is Masahiro Tanaka, who is leading MLB with 12 wins at the time of writing and for most of the year has been near the top in the AL in ERA (2.53), WHIP (1.01), complete games (3), and every other meaningful pitching stat. That’s not bad for a rookie MLB season when he was supposed to be the fourth starter in the Yankees rotation. What the stats (even WAR) don’t tell observers is the cumulative effect Tanaka has had on the Yankees team. Tanaka has stopped losing streaks, saved a bullpen worn out by poor starts, provided leadership for an underachieving team, and refused to make excuses when losing games due to paltry run support. It’s safe to say the Yankees would be in last place without him rather than contending midway through the 2014 season. That’s the definition of an MVP, whether he hits bombs or toes the rubber every fifth day.